Take on the role of a fighter, thief, or wizard, and delve deep into a dark dungeon to defeat the dastardly demon Diabolique! With breathtaking graphics and effects, this mode promises to be the most revolutionary and astonishing dungeon crawl ever made! By combining the tactics and complexity of a roguelike with the mind-blowing 3D action of a first-person shooter, an experience is created that’s completely unlike any other. Supports Occulus Rift, IMAX, and all future virtual reality devices. Prefer a more laid-back experience instead of the stresses of a mind-blowing dungeon adventure? 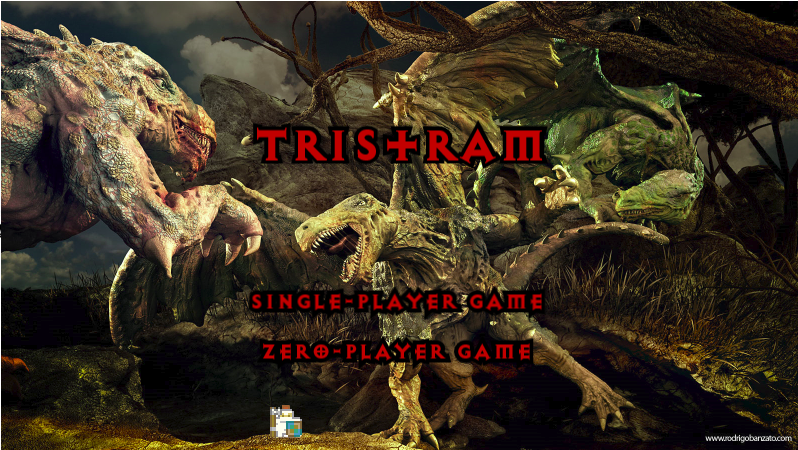 No problem, we also provide a “zero-player” game mode, in which the critical concept of a player character has been omitted! You play as a shop sitting above the dungeon, and can perform other exciting tasks, like setting equipment prices and buying potions wholesale! 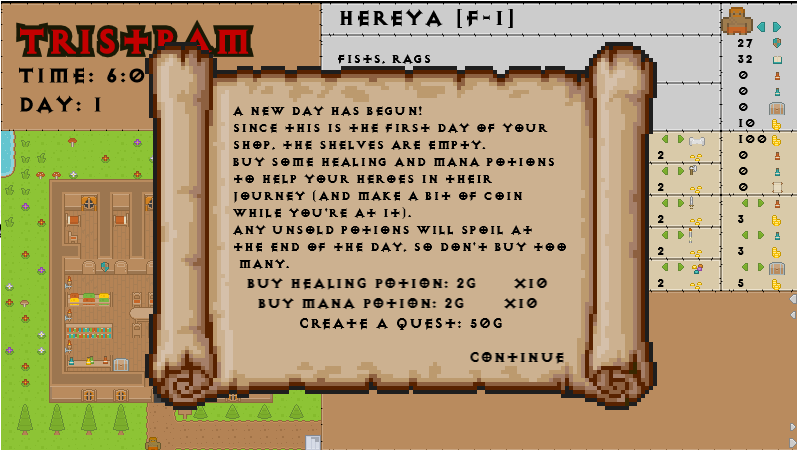 At the start of every new day, you are presented with the opportunity to buy new potions, and create quests. Potions can be purchased at the wholesale price of 2g each (or 10 for 20g), and quests cost 50g. It is a good idea to stock a large number of potions, as this will allow your heroes to fight in the dungeon longer, and increase their chances of survival. Quests will attract new heroes to the town, and the gold is used as a reward given to the next hero who manages to slay a dragon. 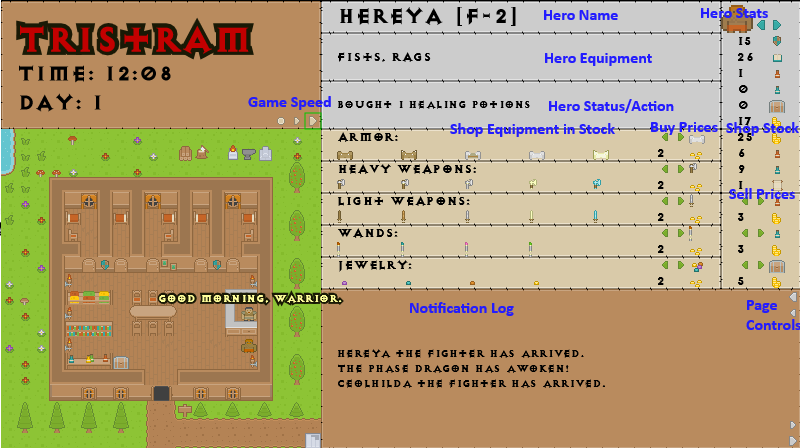 Hero Name: Displays the name of the selected hero, as well as their class (F/T/W) and current level. Hero Stats: Shows a hero portrait, as well as current hit points, mana, healing and mana potions, items in inventory, and gold. The left and right arrows allow you to select other heroes (this can also be done by pressing Left or Right on your keyboard). Hero Equipment: Each hero has a primary, secondary, and tertiary equipment slot. Their currently equipped items will show here, as well as its status (worn or broken). Hero Status/Action: A brief description of what the hero is currently doing. Game Speed: Allows the game to be paused and sped up. Game speed can also be controlled with the keyboard, by pressing Up or Down. Shop Equipment in Stock: The current shop stock, broken out by item type and material. Items farther to the right are more valuable and have better stats. Buy Prices: Allows you to set the shop’s buy price per each item type. This allows finer control so prices may be increased to encourage heroes to sell their items, or decreased if you have too much stock already. A buy price set to 0 will prevent new items of this type from being purchased at all. Shop Stock: The current shop stock of gold, healing and mana potions, and active quests. Sell Prices: Allows you to control the shop’s sell price for healing potions, mana potions, and items. The item sell price is for all item types, and reflects the base price of a level 1 item. Higher level items sell at this price multiplied by the item’s level. 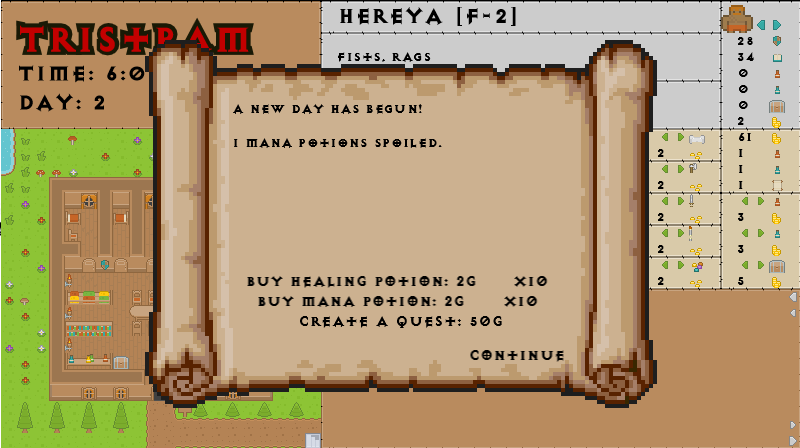 Each new day, you will get the opportunity to buy more healing potions and mana potions (2g per potion), and create quests. Keeping a large stock of potions is essential to your heroes’ success, but be careful not to overstock, as any unused potions left at the end of the day have a chance of spoiling. It is also important to keep active quests going whenever you can afford it. The more quests you have, the greater the chance of attracting new heroes into your town. Additionally, since the full price of a quest goes to the hero as a reward when they slay a dragon, this money is likely to be spent in your shop anyway. Hovering your mouse over a hero’s name or portrait will display their stat sheet. Some stats are shown with a number in parenthesis next to it; this is their base stat, and the number to the left is their adjusted stat after equipment bonuses. Heroes can use several types of equipment, which they will find in the dungeon and gladly buy or sell in your shop (if the price is right). Be careful not to set buy prices too low, or a hero may become frustrated and just throw their items away, or worse yet, leave for another shop. If you set sell prices too high, they may also choose not to buy an item they need, which will hurt their survival chances in the dungeon. Armor: Fighters and Thieves can both wear armor, although thieves may choose to carry a second weapon instead. Armor provides an Armor Class bonus, and is available in many materials, from Leather to Plate Mail. Heavy Weapons: Only usable by Fighters, these range from Crude farm weapons, to finely crafted Mithril implements. They provide a bonus to the hero’s Strength stat. Light Weapons: Used by every class (Thieves can even dual wield two), these provide a bonus to Dexterity and range in materials from Wood to Mithril. Wands: Only Wizards can use wands, which give a bonus to Intelligence. The stone set in the wand determines its power, from simple Garnet to powerful Emerald. Jewelry: All classes can wear Jewelry, and have a tertiary slot just for it, although Thieves can wear a second piece in their secondary slot. Like wands, their stones determine their power, ranging from Amethyst to Diamond. Jewelry can affect any stat. Whenever a new dungeon level is reached, the first hero there will encounter a dragon. These dragons are much stronger than other monsters at that level, but must be defeated before it can be entered. A hero fleeing from a fight with a dragon will find it still waiting when he or she returns, and multiple heroes may all end up fighting the dragon together, although if there are not enough active quests to go around, only some may end up with the reward. The ancient demon Diabolique resides in the 10th level of the dungeon. If he can be defeated, the heart of the dungeon’s evil will be destroyed, and the game will be won.